It’s a strange phone call to make — dialing up a perfect stranger to ask him if he will explode a bomb for you. After a moment of pause to reflect on the irony, I placed the call to Van Romero at New Mexico Tech, home of the Energetic Materials Research and Testing Center, the most active explosives test facility in the U.S. I called him on Thursday, April 25 — ten days after two bombs exploded near the finish line of the Boston Marathon, killing three and injuring 275. It was just a week after the murder of MIT police office Sean Collier and the bloody standoff in Watertown, Mass., that left bomber Tamerlan Tsarnaev dead and the massive search effort that shut down much of the Boston area and led to the capture of his wounded younger brother, Dzhokhar. Miles O’Brien, the correspondent who I have worked with doing science and technology reporting for nearly 20 years, had accepted an assignment from the PBS program NOVA to do a fast-turnaround program on the forensics technology used in the bombing investigation and manhunt. The air date for NOVA was set for May 29 — just a few weeks out. 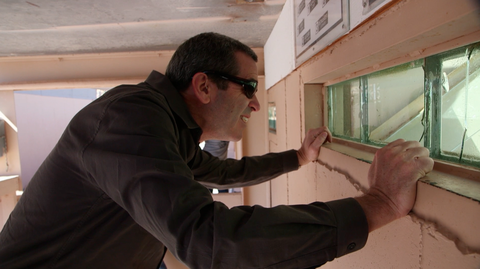 Miles O’Brien waits in a bunker at New Mexico Tech while a team of experts sets off a pressure cooker bomb. By the time we were setting up our production, law enforcement had found the mangled lid of a pressure cooker on top of a six-story building near the marathon finish line. It was the first time I had ever heard of a pressure cooker bomb — though it turns out it is a weapon of choice for terrorists internationally. It is shockingly low-tech. A few pounds of black powder, some ad hoc shrapnel and a pressure cooker like the one my grandmother used to use. Small enough to fit in a backpack. We knew going in we had to step carefully: we absolutely do not want to show anyone how to build a bomb, or give any unstable viewers any ideas. The tricky part to building a bomb like that is the trigger. Van Romero wouldn’t show us that and we wouldn’t have included it in our report in any event. Often times, the logistics of the shoot are the hardest part — I was in my office making calls, videographer Cameron Hickey was on location in Los Angeles, and Miles, as usual, was on an airplane. The shoot date was set for May 1 — less than a week away. Bringing Miles up to speed on the plan and getting his feedback turned out to be harder than you would think. I would try to catch him on the phone when he was changing planes. And he had to watch his mouth — too much chatter in the gate area about detonating bombs was likely to get him tackled by an Air Marshal. 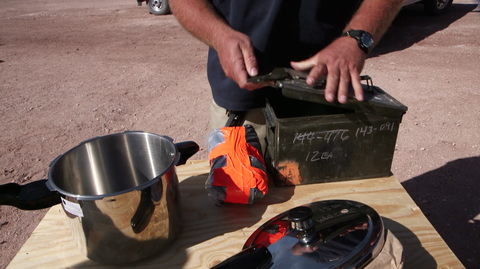 New Mexico Tech experts piece together the elements for a pressure cooker bomb to demonstrate how forensic teams investigate explosives. In the end, we decided to go with two detonations — the pressure cooker bomb and also a pipe bomb. That way, we could compare and contrast the explosions, see how researchers analyze such factors as the color of the smoke, the blast impact and the shape of the bomb fragments. We paid New Mexico Tech for the explosions — it’s not so much the expense involved in building the bombs themselves, but the clean-up costs. Another big factor we had to consider for the production was how we would shoot it. The folks at the Center maintain one high-speed camera near the site of the explosions so they can document the blast for themselves. 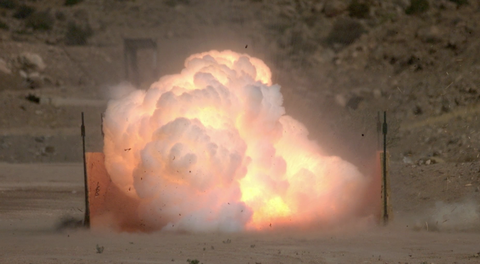 We also set up four GoPro cameras near the bombs and we shot a long-range shot using our Canon-C100 camera. We were prepared to “sacrifice” a couple of the GoPro’s to the blast to get good angles — but in the end, all of the equipment survived intact. At the end of our two days of shooting, one thing was clear: expert eyes can tell a great deal about bomb forensics just by looking. Mix in the lab analysis — like chemical residue testing, DNA testing, and the like — and a bomber would be hard pressed to get past the experts at New Mexico Tech. I’m glad they are wearing the white hats.